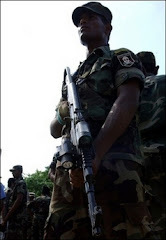 "By and large the Sri Lanka Army is very disciplined. Officers and soldiers are a law abiding group. But I am sad to say a little bit of politics have crept in," says Defence Minister Tilak Marapana. He was responding to a question on politicisation of the Army during an interview with The Sunday Times. Mr. Marapana said the Pahalatalawinne murders and other incidents in Kandy showed some politicians have been trying to use the armed forces to achieve their sinister purposes. "It is very unfortunate that there is this very small handful of people who lent themselves to this type of activity. I can assure you we will deal with them," he declared. He stressed that it was necessary in the greater interest of the Army to identify them. It would also be for the good of the country. He noted that there was a very high degree of politicisation in the Police. During the last seven years, as a lawyer, I have had numerous occasions when people complained to me about the Police. When UNP supporters made complaints, they were not entertained. Police have been extremely partial. MPs have complained in Parliament about this. Mr. Marapana's comments on the raid by Kandy Police on the Army's Safe House at Athurugiriya, during the same interview, appeared in these columns last week. Here are some of the other questions and the answers given by Mr. Marapana. A: Defence or, for that matter any other portfolio, one holds is directly responsible to the Prime Minister. I am not on my own. I have to consult the Prime Minister before making important decisions. That way I am not the sole authority. I cannot do anything I want on my own. Q: How do you feel about taking over this portfolio ? A: I feel we would have been able to do a better job (on the conduct of the separatist war) if we were better focused with regard to our objectives. I feel we have not given sufficient thought and consideration to the many facets that are involved. Q: Can you identify some of them ? A: The military strategy over how we have tried to curb the terrorist movement. I am not only talking about the last few years but right from the beginning. It could have been nipped in the bud. It was allowed to grow and ultimately escalate into this present situation. Our strategies have all been ad hoc. Secondly, I feel that even with regard to military procurements, we have spent unnecessary sums of money in buying very valuable and sophisticated weaponry. I don't think all that was necessary. Q: You speak of strategies. Can you give an example of how it failed and how you hope to rectify them ? A: In the first place, I have no intention at all in waging war with the LTTE at the moment. We have embarked on a peace mission and our target today, and my role as Defence Minister, is not to plan strategy to attack but merely to ready ourselves to defend. I would have to ensure important installations and territory in our control are protected. We are on a defensive posture than on an aggressive one. Most of the past operations failed because there was no proper application of the mind. A: I sincerely believe that we are going to succeed in this. It is my belief that the LTTE, however and whatever others may say, are serious in their endeavours. We have approached the peace process with some degree of professionalism. Prime Minister Ranil Wickremesinghe, has been constantly advocating a peaceful settlement. This is not something he has said just yesterday and the day before. He has been consistent. A: The normal training is there. That part of the training is necessary to keep our soldiers fit so they will not become sluggish. That type of training has been done in the past during times of peace. You cannot allow a soldier to remain without training. He has to be put through the rigors. Q: There has been complaints of LTTE recruitment, re-training and re-arming. What is your response ? A: Our intelligence reports certainly do not show that they are training on such a large scale. They also must be training their cadres the same way we impart normal training. They may continue that. The recruitment may be because there are vacancies in their ranks. They may be doing what we are doing to maintain the forces at the present level. Q: What are your comments about widespread corruption in procurements ? A: Complaints about them have been lodged with the Commission Investigating Bribery or Corruption. I take it that these investigations will continue.